Present-day Interstate 40 roughly follows the route of U.S. Highway 66, John Steinbeck's famous "mother road." 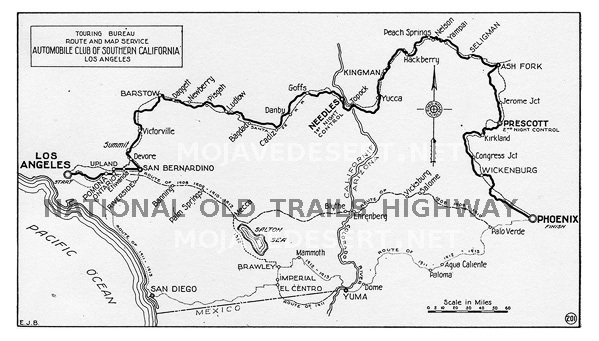 The route developed initially as cross-desert motorists drove as close as possible to the Santa Fe Railway tracks, because the presence of settlements along the line made it easier to obtain supplies and help if necessary. 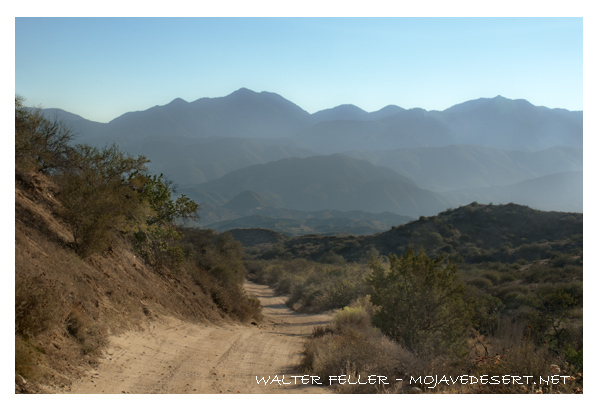 The alignment became known as the National Old Trails Road, as it was progressively graded and developed. The Automobile Club of Southern California placed signs along its route from Los Angeles to Kansas City in 1914 and produced maps of the road to promote its use. The route was designated U.S. Highway 66 in 1926, and paving through the desert was completed by state agencies, assisted by federal funds, by 1931. The road was realigned several times; the initial route through Fenner and Goffs was bypassed in 1931 by a shorter route with a steeper grade. The federal government passed legislation in 1956 that called for the construction of a system of limited access, high speed, multiple lane interstate highways. Construction of Interstate 40 came late in the history of the highway system, beginning in the late 1960s and completed through the desert in 1973. I-40 did not exactly parallel U.S. 66 for much of its length in the Mojave, and the older highway retained its designation until 1985. Since then, it has been known as the National Old Trails Highway, and sees moderate use as an access road. Nostalgia for Route 66 has increased as the convenience and speed of the interstates has become a fixed part of American culture, and desert towns near the Mojave Preserve like Needles, Goffs, Essex, Amboy, and Barstow count Route 66-related tourism as a significant economic strategy.